This tutorial is exclusively to Android 6.0 marshmallow users on this blog Entclass.com. 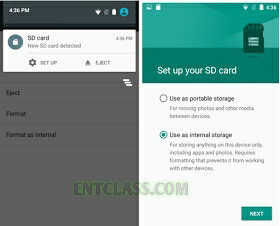 Many people utilizing Android phones that are running on Android 6.0 marshmallow has been complaining of notification that they have insufficient memory even when there are space in their SD card. Today, this tutorial is only for the people using Android phones running on marshmallow. I will be teaching you how to use your SD card as the default memory or as the internal storage for files, data and apps. You won't worry about notification saying that you have low storage memory. All apps or files you downloaded from the internet will be saved in your SD card. All apps, files, media files etc you receive via Bluetooth or flashshare/ Xender will be stored in your SD card. Before you can use the same memory card on another phone or device, you will have to format it again to make it compatible with the device or phone. Make sure your SD card is 16 to 32GB, so it won't get filled up quickly. Make sure you buy original SD card or have original SD card to avoid error. Make sure you back up the data and files in your current SD card that you want to use as the default memory to internal storage or another third party storage cos you'll be formatting the SD card. This steps will not work effectively on Android phones running below Android 6.0 marshmallow. 1. Remove the Sd card from the phone and Switch OFF the phone. 2. Insert the SD card you wish to use as internal storage. You should get a notification that a new SD card has been detected; kindly tap the notification. 4. Tick use as internal storage, then tap on Next. I hope by now, you've back up your data and files to internal memory or another third party storage. If yes, continue. 6. Tick Move now or Move later depending on when you wish to move media files from the internal storage to the newly cooked SD card. 7. Tap Done and reboot your your device. Once your device has complete the boot process, all future apps and files you will receive and download from the internet will be saved in your Sd card as the new default internal memory. With this, you won't suffer from insufficient memory or storage. Kindly appreciate by sharing this post using the share buttons below. Your friends might be needing this.